We deliver Social Networking Website Design with custom and unique features to guide members connect with each other. Are You Looking for Social Community or Social Networking Website Development? 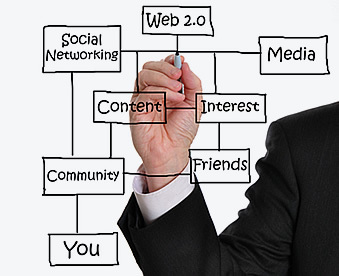 Social networking is a favorite Web 2.0 phenomenon. Websites like Twitter Facebook, Myspace, and LinkedIn have expanded at such a fast rate that a lot of companies now look to have social networking site. The main factor in owning your personal social networking site is the strong communication you have in between yourself and the customer. The present trend, social networking is one of the ideal ways to use people in program to interconnected each other and create a network or social connection as per their interest. Having your own social networking website provides your company total control over the message your clients and brand loyalist receive to see and take in. SOFTWARE ISLAND is a best company to offer online Social Community and Social Networking’s Website Development by our competent, highly experienced web developers. Our developers are tremendously knowledgeable in latest trend and give you the most beneficial ROI and high quality to build a social networking website. You may hire our competent Social Networking Developers for your Social Networking project. Our professionals are high skilled and having substantial experience in creating social network website design, custom Social Network Applications development. Why Software Island for Social Networking Development?